From the health implications of digital technologies to the effects of keeping kids sugar-free, topics for the Healthy St. Mary’s Partnership Annual Meeting will cover a large range of issues. The meeting, planned for 12:30 to 5 pm Thursday, Sept. 13, 2018, at the Southern Maryland Higher Education Center, will feature Shalini Misra as the keynote speaker. MedStar St. Mary’s supports the Healthy St. Mary’s Partnership. Shalini Misra, Ph.D., is an assistant professor in the School of Public and International Affairs at Virginia Tech University. Her research focuses on the social, psychological, and cultural implications of the Internet and mobile communication technologies, as well as the study of the processes and outcomes of transdisciplinary collaborative scientific, training, and action research initiatives. The annual meeting offers participants the opportunity to network, learn from public health experts and receive updates on local efforts to improve overall health. For more information, including speaker information and the meeting schedule, visit the Healthy St. Mary’s Partnership website. 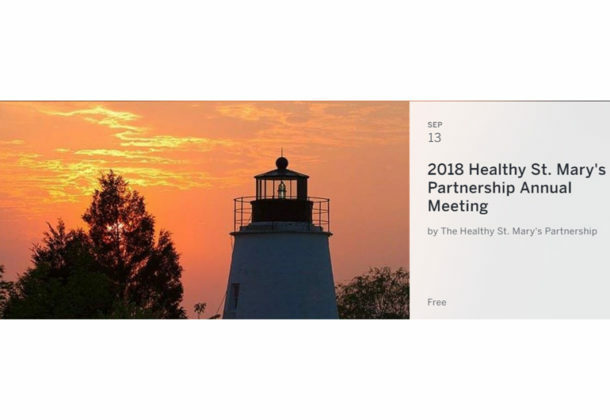 Anyone who is interested in the creating a healthier St. Mary’s County can attend the annual meeting — it is not necessary to be a member of the partnership. Still, everyone is welcome to become a member for free by visiting the partnership’s website. The Department of Social Services will coordinate CEUs for interested attendees. Participants who meet the requirements will receive their CEUs by mail. Printed tickets are not required to attend but all attendees are asked to register to allow enough seating, handouts and refreshments.